Probably my all time favourite bride and someone I could wax lyrical about all day long. Margherita wore a customised Giambattista Valli dress using Missoni silk & organza adorned with embellishment and embroidery. Every detail of Margherita's wedding was perfection. From the bridesmaids who wore Missoni, Margherita's art deco head piece and the heart shaped berry cake, she will forever be my favourite bride. 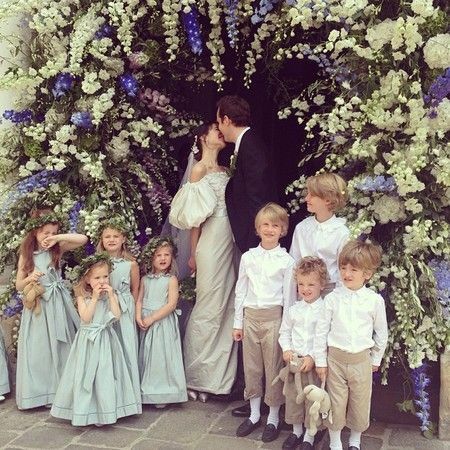 French actress and Chanel muse Anna Mouglalis married in the South of France wearing a Chanel Haute Couture two piece. The dress alone is amazing, but the trousers worn underneath make it look so utterly chic and delicious. I am not sure if many other people could pull this look off and on paper it sounds crazy, but I am sure you will agree, the trouser under dress combo is a winner. Stylist Caroline Sieber married in Vienna wearing a customised silk Chanel dress with the most beautiful ballon sleeves I have ever seen. I have a real weak spot for an off the shoulder dress and Caroline's Chanel creation is the epitome of elegance, and please, don't even get me started on that flower archway! I can't get enough of the embroidery on this customised Givenchy Riccado Tisci dress which was worn by Vanessa Traina for her San Fran wedding. It is so modern with the contrast zip detailing, yet still completely classic with the beautiful embroidery. Just look at the detailing on the back. Margaux Hemmingway's wedding dress from 1975 still looks as relevant as it did over 40 years ago, which if you ask me, is a sign of a true icon. The victorian pie collar crust combined with broderie anglaise is to die for.